B.B. 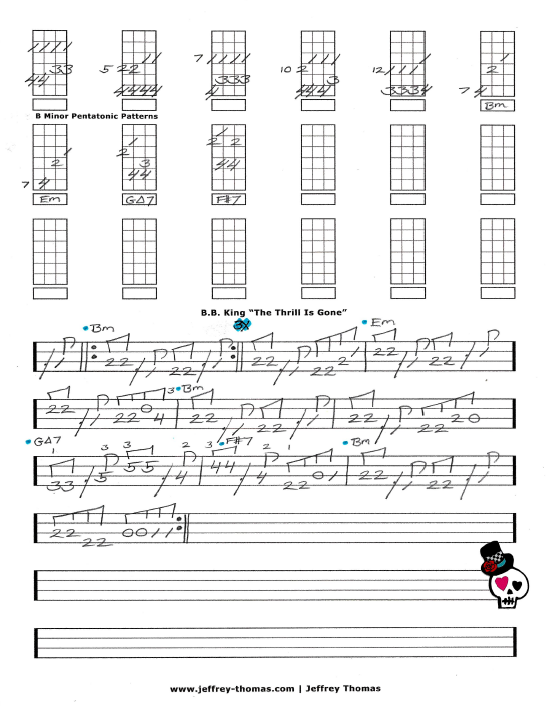 King The Thrill Is Gone Free Bass Tab by Jeffrey Thomas. Learn this classic minor blues tune with my free bass tab! I have one chorus through on the chord progression following the original recording. Also, all 5 pentatonic patterns in B minor with arpeggios. Have fun learning this must know bass tune! Want the full bass tab for free? Send in your email using the form provided. Looking for online bass lessons? Fill out the Schedule A Free Bass Lesson form to set up your free Skype bass lesson today. “The Thrill Is Gone” was written by Roy Hawkins and Rick Darnell in 1951 and became a major hit for B.B. King in 1970. Find more great, free online bass tabs on my blog, video and tab pages.